The Office of Disability Services (ODS) receives around 300 requests for note-takers each semester. As a peer note-taker, you can positively impact your classmantes and your own academic performance. Refine your academic skills and serve fellow students as a peer note-taker! Every semester, ODS is seeking students who take thorough, clear notes; record important course content; and are willing to help other students succeed. It is rewarding and convenient to be a peer note-taker. Notes can be uploaded to ODS’s convenient online portal any time. Not all courses qualify for the note taking accommodation; courses that do not occur in real time or have no lecture/notes component do not qualify for notes, including online-only, developmental math, non-lecture courses, etc. Please contact ODS if you have questions about which courses qualify for note taking. ODS facilitates access to note-taking accommodations for students with documented disabilities. Eligible students have disabilities that may inhibit their ability to take notes, due to a variety of reasons: it may be a physical (limited use of hands, low vision, interacting with a sign language interpreter, etc.) or non-physical reason (difficulty listening and writing at the same time, difficulty transcribing verbal information). By being a note-taker you are making a commitment to ODS to assist in providing required accommodations. More importantly, you make a commitment to the student for whom you are taking notes. Your notes are a vital component of a fellow Raider’s academic success. 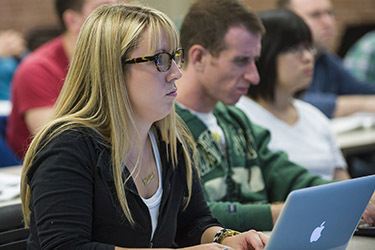 To qualify to become a peer note-taker, you must be a current Wright State student with 3.0 GPA, who is currently enrolled in a class that requires a note taker. You receive an email from Shonda Jones in ODS, explaining that you have a student registered with ODS in your course. You elect to take notes for ODS or a particular student (availability based your current schedule & note taker demand). If you wish to participate, email Shonda Jones, coordinator of the note taker program; be sure to list the classes for which you are willing to take notes. Disability Services will notify you via Wright State email if you have been matched with a note-taking assignment. Once matched, you will be registered for an account for our online database, the Accessibility Information Management (AIM) system. You will be instructed to log into AIM and sign a note taker agreement acknowledgment. Upload notes to AIM database within 24 hours of the end of each class session. The AIM portal is the only accepted method of delivery for those who wish to be compensated. (Optional) Complete biweekly timesheet in WINGS Express if you wish to be paid for this service. Please email the notetaking services coordinator to inquire about the necessary forms. Correspond using secure Wright State email addresses ONLY. Notify ODS immediately of any note taking concerns, absences from class, or changes in your class schedule or phone numbers. Volunteer note-takers can receive community service hours from ODS, which may qualify certain academic or extracurricular program requirements. At the end of the semester you may request to receive a digital copy or pick up a hard copy of a letter verifying your volunteer hours. Provided detailed class notes for qualified students registered with the Office of Disability Services. [# weeks or semesters] of accommodation note-taking service were completed. If you choose to be compensated, you will be paid for the sharing and timely delivery of your personal class notes in the agreed-upon format. Each note taker will receive a predetermined amount for compensation (approximately $59), based on the length of time notes are provided. At the end of each bi-weekly pay period, you will report ½ hour per week that notes are provided at a rate of $8.55/hour. To be compensated monetarily, note takers must 1) Submit a completed student employee hiring packet, to Career Services (334 Student Union) within 30 days of the first day of the term and 2) complete and submit a biweekly timesheet via WINGS Express; reporting one ½ hour per week that notes are provided (7 hours total, over the course of the semester). Put the class session date and course number (BIO 1110-04) on the first page.